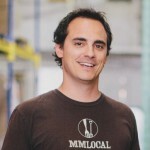 Meet Jim Mills, Founder and CEO of MM Local Foods, a Denver company that is preserving local produce at the peak of its ripeness so it can be enjoyed year round in Colorado. We caught up with Jim to see why local food matters. Make sure to look for MM Local at the Slow Food Farmers Market this weekend, Sunday October 2. How does local food play a central role in your life? I’m fortunate to have started a company that celebrates amazing local food every day by pickling, fermenting and preserving the best of our local harvests. At MM Local, we are either making local food, tasting local food or figuring out new ways to connect people to our products. From my experience, food that travels shorter distances and is grown and processed with integrity tastes the best. And knowing the people and sharing the stories behind our food provides a sense of community that is second to none for me. At home, my family loves eating food from our garden and cooking sustainably raised beef, bison, pork and lamb grown by local ranchers (thanks to some great Slow Food connections). Tell us your story. How did you get to where you are now? I grew up in Kansas, and prior to starting MM Local, had a diverse business career across tech, marketing, and consulting in San Francisco, New York and Boulder. I have always had a passion for listening to the customer and challenging the status quo with what I believe is right. I believe our food system is broken and detached from many people’s food values. I started MM Local to create a trusted brand for real, farm to table food, that people could find in their favorite grocery store. How do your local food values show up in your business? We celebrate what farms grow by using the simplest, artisanal recipes that highlight what delicious produce tastes like at its peak of flavor and ripeness. Transparency and direct connections with growers run through MM Local’s DNA. Our signature Transparency Label connects customers to the family farm that grew the produce inside every jar. We are also helping organic family farms grow by creating a new, year-round market for their produce, contracting with them in advance, and preserving “ugly” produce that grocery stores don’t accept based on looks.